The Crocodile Specialist Group (CSG) is one of more than 120 species specialist groups within the IUCN’s Species Survival Commission (SSC). Formed in 1971, the CSG has grown from a small group of dedicated individuals making up the group in the early 1970s, to an international network of over 500 members in 57 countries. Five Chairs have presided over the CSG during its 40+ year history: Hugh Cott (1971-1973), F. Wayne King (1973-1978, 1983-1989), H. Duke Campbell (1979-1980), Harry Messel (1989-2004) and Grahame Webb (2004-present). The CSG was formed at a time when the “conservation” movement was still in its infancy. At that time the CSG was faced with populations of most crocodilians being drastically depleted, mainly as a result of indiscriminate hunting for the skin trade. It was thus not surprising that early efforts focused on stopping those population declines, with “total protection” as the main form of management regime being advocated. But by the mid-1980s, when some crocodilian species began to show recovery, it became clear that this strategy was insufficient to maintain conservation efforts into the future. The concept of conservation through sustainable use was thus adopted by the CSG as cornerstone of its conservation efforts, and continues to this day. The CSG has achieved great success with the conservation of the world’s crocodilians, although challenges still remain with some endangered species. The secret of the CSG’s success lies with its integration of a diverse group of people into its ranks, including members of the crocodilian skin and fashion industry. The 1st CSG working meeting, held in New York (USA) in March 1971, had 15 participants. The 3rd working meeting (Maningrida, Australia) in 1976 had 21 participants. Nowadays, the biennial CSG working meetings typically involve the participation of over 200 participants, and with a 4-5 day program, reflecting the depth of activity in crocodilian research, management and conservation around the world. 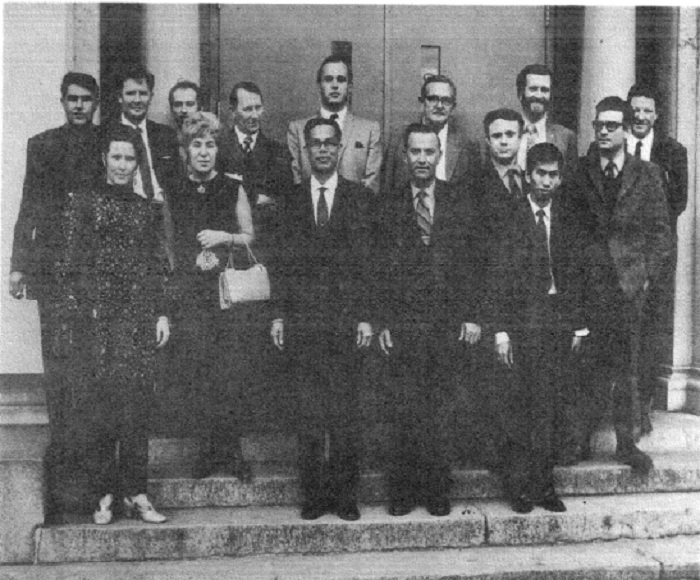 Participants of the 1st CSG working meeting (New York, 1971): From left; Tony Pooley (South Africa), Moira Warland (IUCN), Max Downes (PNG), Peter Brazaitis (USA), Claire Hagan (USA), Angus Bellairs (UK), Utai Youngprapakorn (Thailand), Robert Bustard (Australia & UK), Robert Chabreck (USA), Hugh Cott (UK), James Powell (USA), F. Wayne King (USA), Suphachai Yungprapakorn (Thailand), Rene Honegger (Switzerland), Frederico Medem (Colombia). Photo credited to New York Zoological Society. 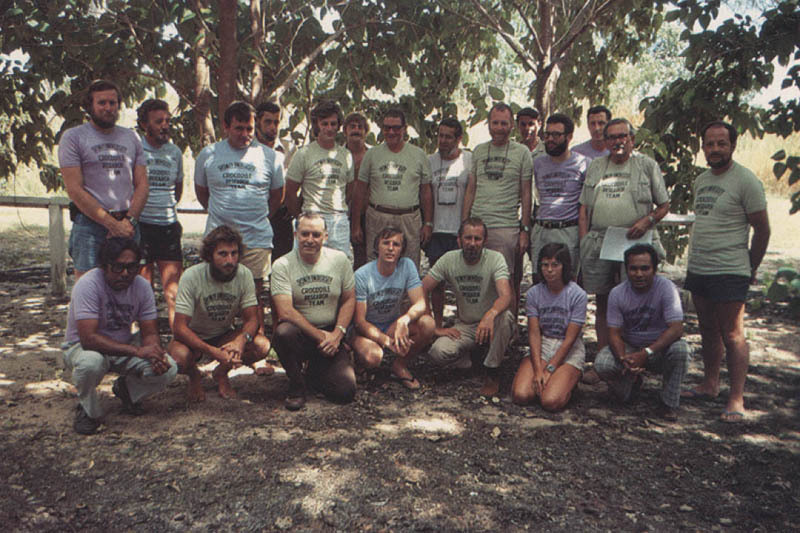 Participants of 3rd CSG Working Meeting (Maningrida, Australia, 1976): from left, standing: Gordon Grigg (Australia), Murray Elliott (Australia), Dave Lindner (Australia), Michael Yerbury (Australia), John Lever (Australia), Grahame Webb (Australia), Frederico Medem (Colombia), Harry Messel (Australia), F. Wayne King (USA), Tony Pooley (South Africa), Rene Honneger (Switzerland), Ted Joanen (USA), Hugh Cott (UK), Vic Onions (Australia); kneeling, J.C. Daniel (India), Bill Magnusson (Australia), Robert Chabreck (USA), Richard Gore (USA), Howard Campbell (USA), Janet Taylor (Australia), Navu Kwapena (Papua New Guinea). Photograph courtesy of Professor Harry Messel. 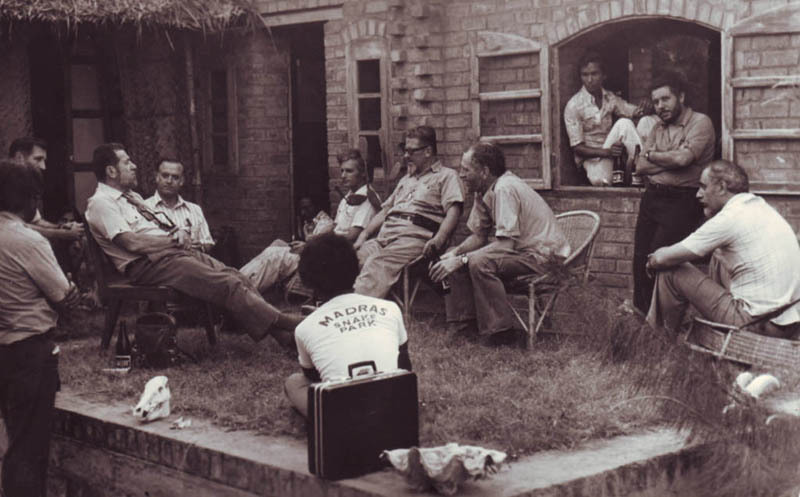 Participants of 4th CSG working meeting (Madras, India, 1978): from left, J.C. Daniel (India), Ted Joanen (USA), Zai Whitaker (India; sitting, background), Harry Messel (Australia), Robert Chabreck (USA), Satish Bhaskar (doorway), John Lever (Australia), Frederico Medem (Colombia), F. Wayne King (USA), Allen Vaughan (India), Federico Achaval (Uruguay), Karlheinz Fuchs (Germany), Patrick Aia or Miro Laufa (Papua New Guinea; foreground). Photograph: Rom Whitaker (India). 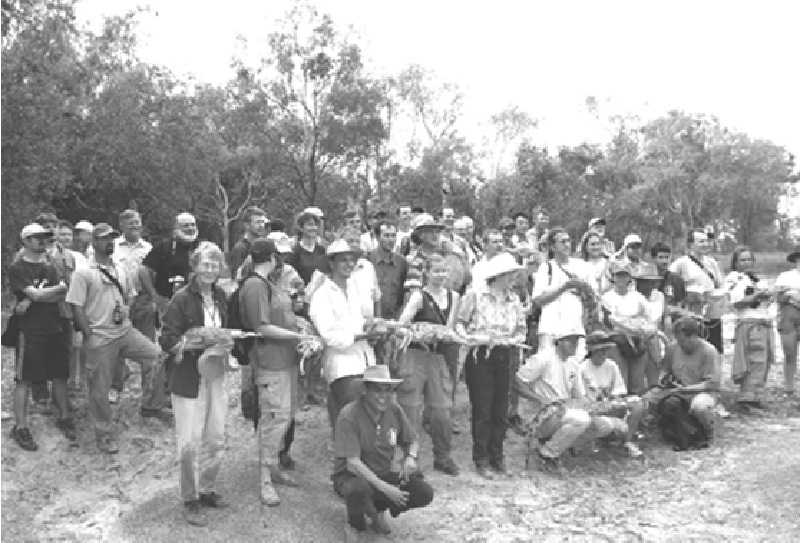 Participants of the 17th CSG Working Meeting (Darwin, Australia, 2004) enjoy a field trip to the McKinlay River.